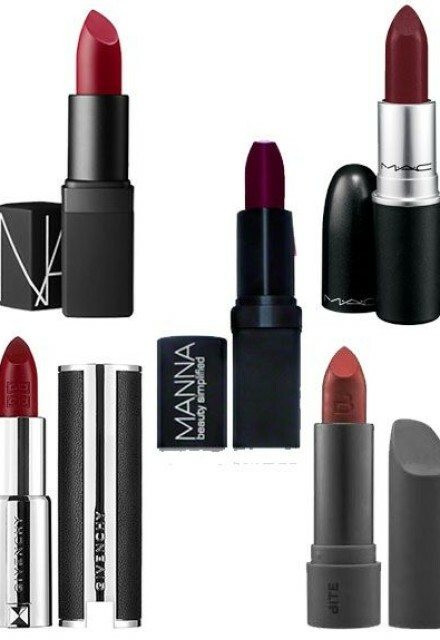 Dark lipstick back into fall makeup trends. The celebrities, fashion models, and women become more frequent lately daub dark lipstick color to display bold and daring. Choosing dark color lipstick was not in vain if you do not want the result too gothic or just creepy . Before experimenting and performing with a dark lip color, first consider the color of lipstick that matches the color of the skin. For whites with cool undertone , berry and burgundy lipstick color would suit young. While for medium skin color with neutral -warm undertone, dark lipstick color any appropriate, but the best is the color purple, wine and burgundy. Lastly, you should wear a dark skin color dark burgundy, wine, brown, or even black. Lipstick on the basis of soft orange color corresponding to the dark -skinned face. If you’ve found the appropriate color, makeup make as simple and natural as possible. Let the dark color of your lips the center of attention. Instead of pairing a dark color lips with smokey eyes makeup, you should remain natural with makeup eyeliner cat eyes. For makeup, make natural as possible and add highlights in certain areas . Dark lips must always be inclined to force a radical and a bit boyish as you are bad girl . To view the grunge style, fashion will be very compatible with a dark lip makeup. Matching leather jacket with a plaid dress or dark faded jeans. Dress all in black is also suitable for display as a vampire. If you want to look casual, matching lip makeup with dark skinny jeans and a baggy sweater .